Bit of a sod, really. In January, we lost my precious girl, Lunil. Her back legs gave way over a weekend, and only left us two days to say goodbye. She was only 11. 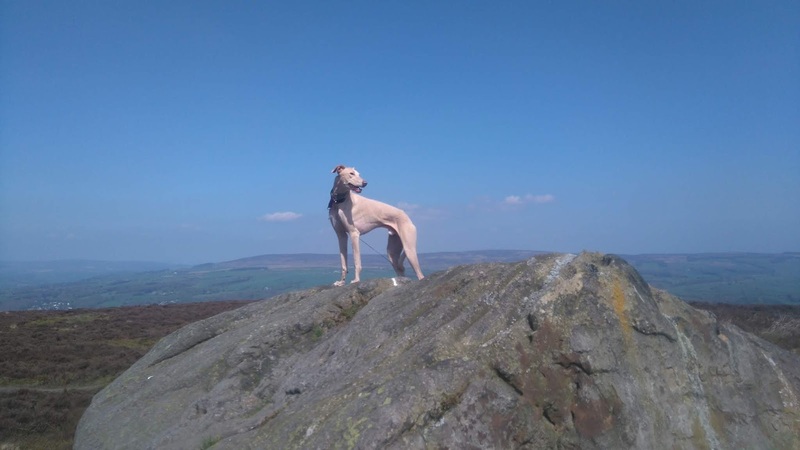 But life went on, and Hector the elegant blond lurcher carried on with us. It was very strange being in Wales for Wonder Wool with only one dog. But we had a good tome in Edinburgh in March, visiting Holyrood, walking lots, and seeing Tidelines for the first time. This was a very hot day in May, walking back from Ilkley over the Moor. This is one of the ancient art worked stones up there. I seemed to do more teaching than usual this year. This was the spot we stayed again when I did a weekend's workshop for Grampian Guild at the end of June. More baking weather. In July we went to Scotland again, for the final Runrig gig. And then Arthur came to us; another rescue, private this time. He came called Thor, but he's got bigger, fluffier, and turned into an Arthur. Back to Scotland in October for the big AOUB independence march - flailing against all the horrible politics going o this year. But we're here at the end of the year, and I'm spending New Year's Eve quietly spinning. Hang on to the good things, and be kind to each other next year. Keep in touch. Carry on Spinning, knitting, and all things textile.